Helen Bath is testament to the proposition that not only business but community, can reap benefit from adopting new technology and up-skilling in online communication. 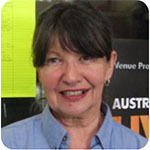 As voluntary operations manager at Voice FM Ballarat Community radio she has extensive experience with community broadcasting, through management and in hosting programs, since 2000. Her programming role in 2004 established the “Community Voices” radio program that highlighted the philanthropic work of United Way. Following election as a Board Member Helen was instrumental in improving the financial position of the Station, and in building connections with the Station and the community. Helen’s nomination as a Digital Champion is exemplified by the advocacy, training and hard work that leveraged the Station’s capacity to broadcast live at local music and community events. Voice FM’s longevity and reputation in community broadcasting is in no small part a reflection of Helen’s willingness to push for the latest information and communication technologies. She has pushed for Voice FM to broaden programming scope, benefitting the wider community especially in the multicultural arena. Today, the age and culturally diverse team of volunteers at Voice FM have embraced training, competently managing technology across all aspects of the work. Volunteers are trained in computer use, internet access, production, and all aspects of the station’s operations. Helen Bath and the volunteers use Streaming, Facebook, Twitter and an interactive Website. This has increased the Station’s reach within the local community – as well as with listeners around the world. Investment in and adoption of Technology has enabled community radio in Ballarat to become truly interactive and universal. Through her work Digital Champion Helen Bath has been instrumental in positioning Voice FM Ballarat Community Radio as an NBN ready organisation.